With its chardonnay exterior and NeveRust stainless steel drum, the LG DLGX3886C is ready to please both those with busy schedules and those who are willing to take time to explore its features. There are, after all, 14 drying programs and 12 options to consider. There ought to be a perfect cycle for just about any user. Powered with 14 drying programs, 12 options, 5 temperature levels and heaps more superb features and functions, the LG DLGX3886C is actually a compact appliance despite the fact that it has a large capacity. The features and selections that are packed in this appliance make the product highly programmable and customizable. With the Sensor Dry System, the LG DLGX3886Cis able to detect the degree of dryness of wetness of the load. So, it is able to set the right drying time needed to completely dry the garments. The shortest amount of time for drying is 20 minutes. Steam is used on the garments not just for thorough drying action but also for getting rid of odors and for keeping the garments fresh. The True Steam Technology is made to good use in the LG DLGX3886C. For busy users, the LG DLGX3886C is a real treat. The dryer can finish removing the moisture from the load at 20 minutes. Of course, drenched loads may take longer, up to an hour. However, there are other features that make life just a little bit easier for people on the go. The SteamFresh cycle, for example, can freshen up clothes in just 20 minutes. The EasyIron option, on the other hand, reduces wrinkles and creases so that the user will not take long with the ironing. If enough creases are removed, there may even be the possibility of not needing to iron at all. The chardonnay exterior is a real attention-catcher. The unconventional color gives the ownerís laundry area some pizzazz. As for those who prefer the conventional, there is always the white alternative to consider. 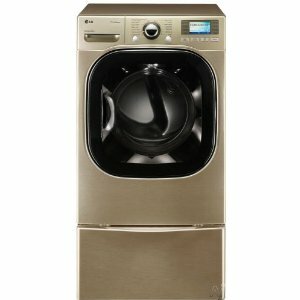 With 7.4 cubic feet of capacity, the LG DLGX3886C should be able to accommodate a dayís laundry. Because of this, the user can easily finish his laundry in a much shorter period of time. By saving time, the user can perform other chores or attend to other duties. The drum is made of NeveRust stainless steel, built to last. Highly programmable, the LG DLGX3886C has something for every kind of user. Both domesticated and undomesticated users will be happy to explore the various options available. The LG DLGX3886C can finish drying a load in a span of a mere 20 minutes. Many users appreciate a good time saver. Ironing can be made easy or maybe even skipped with the helped of some features that reduce creases and wrinkles. Because steam is put to good use, the consumer can expect fresh and clean-smelling clothes. Because this is a gas dryer, it may not be allowed in some gas-free residences or apartments.